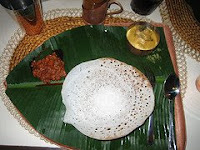 This popular breakfast item needs some time for preparation but the result is worth the time.Traditionaly palappam is made in a different way but my version is simple and very easy to make. Method:Soak basmati rice in water for 4-5 hours.Add little lukewarm water to the yeast and sugar and keep till it rises.Grind together basmati rice and cooked rice along with coconut milk into a very smooth batter.Add the yeast solution into the batter and mix well.Leave it overnight for fermentation.When the batter is ready,heat a non-stick 'appachatti' or any other kadai which has a lid.Pour a ladle of batter into it and spread it a bit by twisting the pan with your hands.Cover and cook on medium heat for 2 - 3 mins or till it has cooked well. It is well served along with Vegetable Stew.